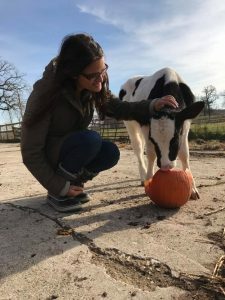 As I drove past crop fields and rolling hills in the Iowa countryside, my thoughts drifted to how I started my vegan journey and found this calling. Within the past year I have experienced the ups and downs of a vegan lifestyle, especially with how it fits in a college setting. It was a steep learning curve, but I feel as though I’ve become more aware about what I am putting both in and on my body. A few months ago I found a recommended account on my Instagram feed for an Iowa Farm Sanctuary. 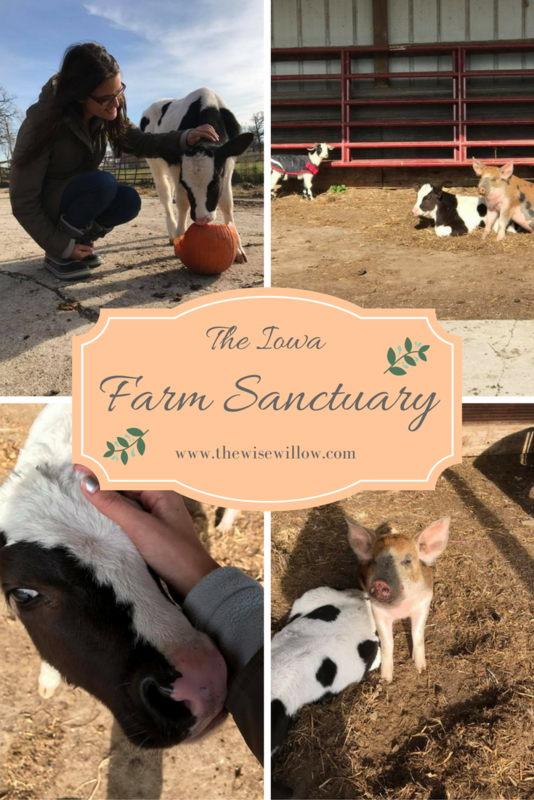 I had heard of farm sanctuaries around the country, and was immediately intrigued! I found out that it wasn’t far, and knew that I had to schedule a visit! Prior to this visit I didn’t have many experiences with the animals that inspired me to adopt this lifestyle, and I was beyond excited to finally get that chance. Those of you who have known me for a while know that I am a bit obsessed with pigs. Ever since I was little they have been one of my favorite animals, and yes, it was on my bucket list to meet a pig in person! My dream came true last week, and I couldn’t wait to start writing about this wonderful organization! I have always been an animal lover, and I spent much of my childhood on a farm when I started horseback riding. 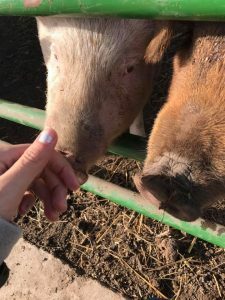 I was so excited to reconnect with this passion of mine, and my heart was filled with pure joy the entire time I was at the sanctuary! The first animal that I got to meet was Bennie, an adorable goat who came to the sanctuary as a runt. He was the sweetest thing, and full of boundless energy and love! He was roaming and eating with Carl (a calf) and Hope (a pig) in the pasture. I then met Carl and Hope, who also melted my heart with their affectionate dispositions and incredible stories. Carl was a calf that was very ill when he was brought to the farm. He was nursed back to health, and is now full of love and joy! He loved eating the pumpkins in the pasture, and basking in the sun with Hope and Bennie. Hope was brought to the sanctuary as a runt who had a broken foot and leg. She was nursed back to health and now loves to dig in the dirt and bound across the pasture! She was the first pig that I have met, and I will always remember the moment when she touched her nose to my outstretched hand. 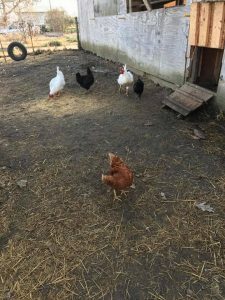 The chickens and ducks enjoying the brisk November day! The sanctuary is also home to a number of chickens and ducks, some of whom were rescued as chicks/ducklings. They have found a wonderful home at the sanctuary. I got to meet one of the hens, Piper, who has a clipped beak (most likely from the farm she came from, which is a common practice on factory farms). 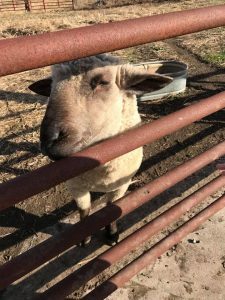 She was nursed back to health, and now enjoys a life of love at the sanctuary. I also met Otis the ram, who had the softest fur imaginable! He is older (eight or nine), and came to the sanctuary when he was found roaming around after escaping from his property. 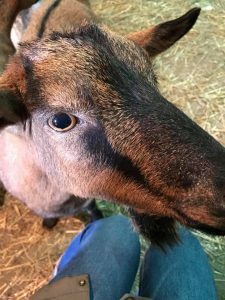 I had the chance to meet three goats in the barn, a mom and two babies. Though they were timid at first, they loved affection! They especially loved the hay and alfalfa in the barn, and running around together! 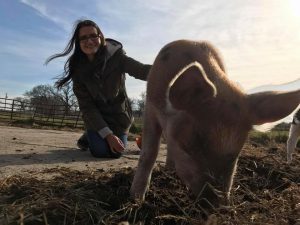 As I met all of the animals living together in harmony, I felt aligned with my vegan journey in a way that I haven’t been before. I have met the animals that my heart aches for, and it was a truly transformative experience. Though my academic study is in Religion and Politics, one of my other passions has always been animal welfare. After seeing this sanctuary, I feel inspired to get involved in every way that I can and to potentially start a sanctuary of my own in the future. I left the farm (as Bennie, Carl, and Hope ran to the fence to say goodbye!) feeling inspired and spiritually aligned with my true self and my passions. Being vegan definitely hasn’t been easy, but I would choose this path again in a heartbeat. I’ve been looking forward to sharing this experience with you, and I hope you enjoyed hearing about this wonderful organization! 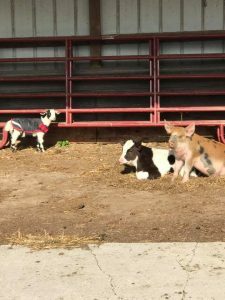 You can learn more about them on their website as well as on their Instagram (which I highly recommend, because who doesn’t love to see amazing pictures of adorable farm animals??)! Ohhh my days this is the cutest, most adorable post I have ever read in all my time of blogging! It actually brought tears to my eyes learning about these animals and their stories! Thank you so much for your kind words, they mean the world to me! 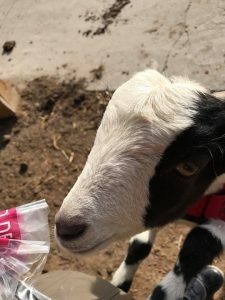 I think this was my favorite blog post that I have written over the entire course of my blogging career because I have such a passion for these beautiful animals! 🙂 I am so glad that you loved learning about them! I will definitely be writing more posts about them in the future! I also have a post about Mission Wolf (a wolf sanctuary that I volunteered at when I was in middle and high school here if you are interested! https://thewisewillow.com/organization-spotlight-missionwolf/). Thank you again for your wonderful comment and for reading my blog!